If you’re tired of the look in an outdated bathroom, you might be considering a remodel. However, many homeowners put it off simply because they’re overwhelmed by the prospect of tackling a renovation in such an important room in the home. Whether it’s a master bath, a guest bath, or a powder room, a makeover is easier than you may think. You can actually refresh the space in just a few hours with a one-day professional remodel. Here are the biggest benefits of choosing a one-day bathroom remodel. One reason why many homeowners put off remodeling projects is that they don’t want to deal with the inconvenience. This is especially true with bathroom renovations because it can be uncomfortable to have a bathroom out of commission for days or weeks at a time. In some homes, it may not even be an option to go without a bathroom. With a professional remodel done in a day, you won’t have to worry about your bathroom being out of order for more than a few hours. The result will be a refreshed, updated room with all of the elements that you choose. Taking on a remodel of the bathroom without a plan can quickly become expensive. Having it done in one day is an affordable option since the project won’t be long and drawn out. You’ll know what you’re having installed ahead of time, and you’ll know how much it’s going to cost. Taking days or weeks to complete a remodel can be quite costly, especially if you haven’t done your homework about the materials and labor costs. You can also end up choosing items that are out of your budget. This can delay the completion of your renovation, as you wait to have the money to actually get the job done. If you want to have an efficient and affordable bathroom makeover to bring it up to date or deal with mold and mildew issues, choosing the same day option is your best bet. 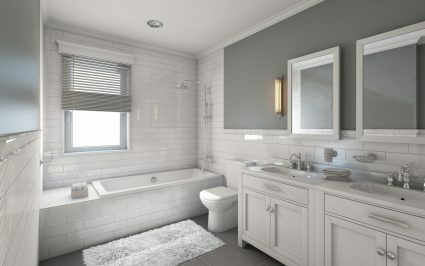 Homeowners seeking to refresh one of the most important spaces in the home will find that a bathroom remodel is a smart investment. Whether you’re planning to sell in the future, or are planning to stay in your home, having a beautiful bathroom that you love will be a big benefit. A modern, clean, and well-maintained bath is an excellent return on investment. Transform an outdated or ordinary bathroom into a luxurious retreat that you’ll enjoy for many years. Just because the project is done quickly doesn’t mean that you’ll be sacrificing quality and style. In fact, a fast remodel ensures that you get the look you desire for a price that you can afford. You get to select the elements to create the bathroom you’ve always wanted in your home. If you’re ready to give your bathroom a facelift, consider the many benefits of a one-day bathroom remodel and contact us today.